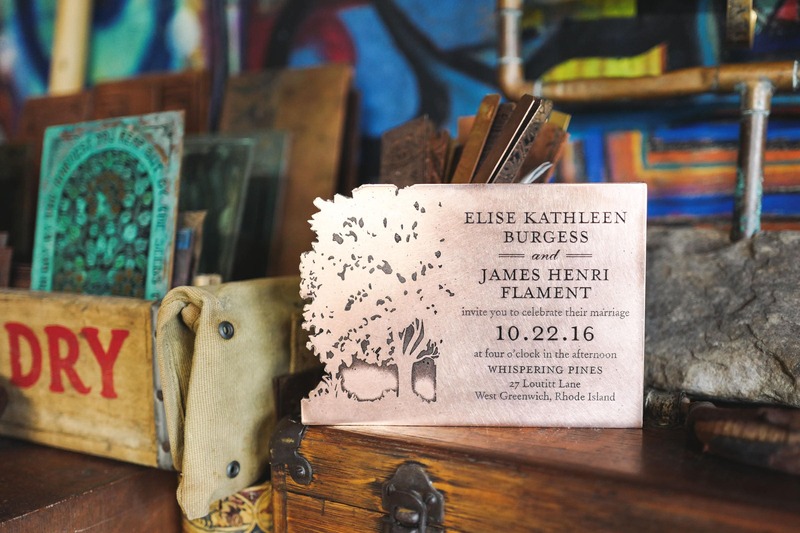 Thank you for visiting Copper Wedding – a Copper Art Designs production. A wonderful personalized wedding gift idea for newlyweds, and happily married couples with an elegant way of remembering their special day that will stand the test of time and will be a lifelong heirloom for generations to come. 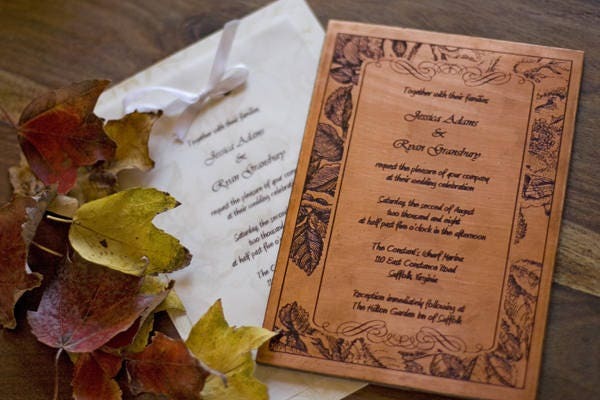 Our ability to etch your Wedding invitation or certificate into copper (actual size of wedding invite) is unique due to the intricate creation process which is all handcrafted and involves designing, hand-tooling and if required some natural patinas to be applied on to the copper. 1. ORDER: Start by adding the item to your cart. 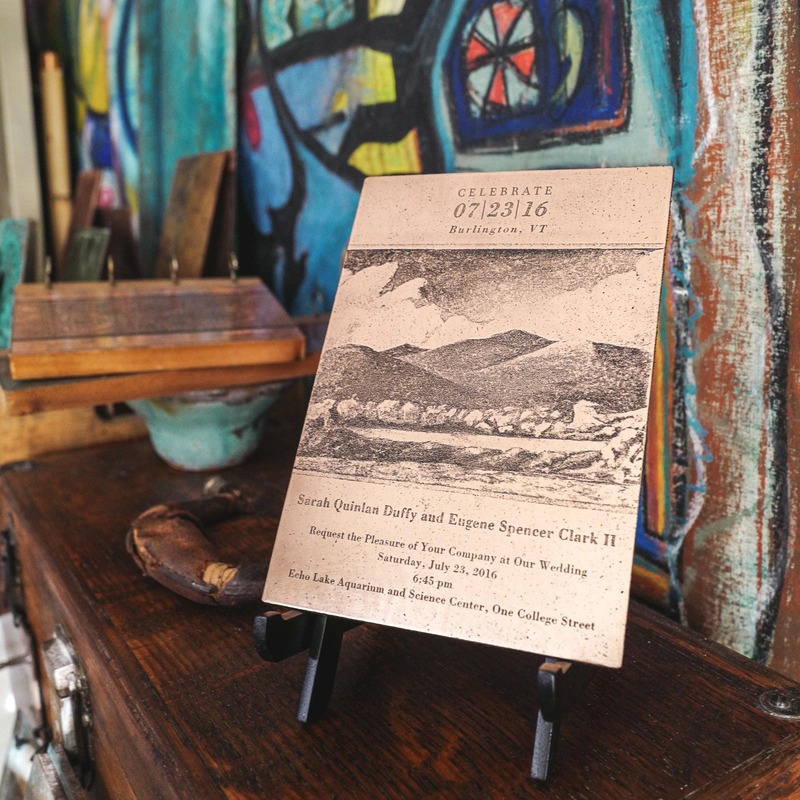 You can purchase the Copper Invite with or without an easel. 2. WHAT I NEED FROM YOU: The “Wedding Invitation” (There are two ways in getting us the Wedding Invitation). wedding invite and send it to us via email ( team [!at] vbcopper.com ). * Note that the [!at] is an @ sign. 3. COMMENTS/NOTES: Please email or Etsy convo me if there is something special or any modifications that you may need on your wedding invite. E.g. remove website at the bottom of the invite, misspelling, etc. Also, if you are sending it as a gift (different address than yours) and you would like for me to provide a personalized note/message please include it. 4. 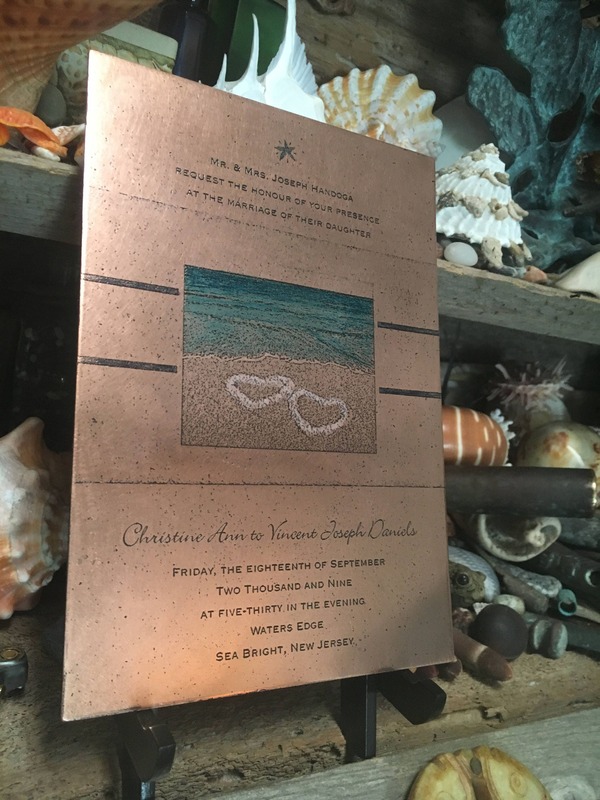 PROOFING: A digital copper draft proof of your wedding invite will be emailed to you for review and approval within two (2) days of submitting your order. 5. 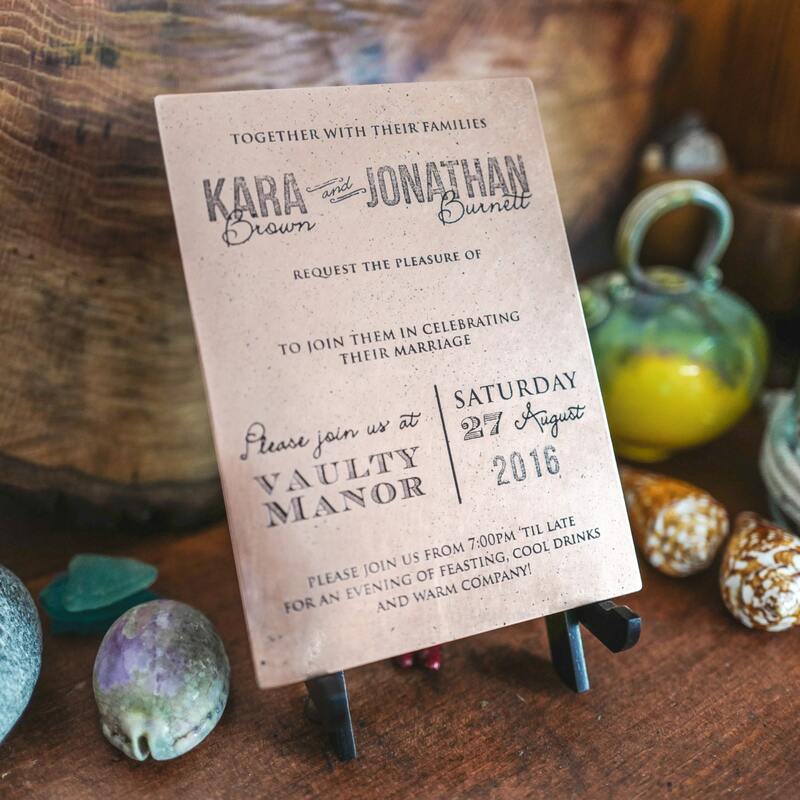 APPROVAL: After your approval of the digital copper draft proof of the wedding invitation, your design will be prepped for etching. 6. PRODUCTION: This item is handmade to order. The Copper etching and Patinas goes through a series of processes and it takes time. Our time frame for processing varies depending on our current order volume. 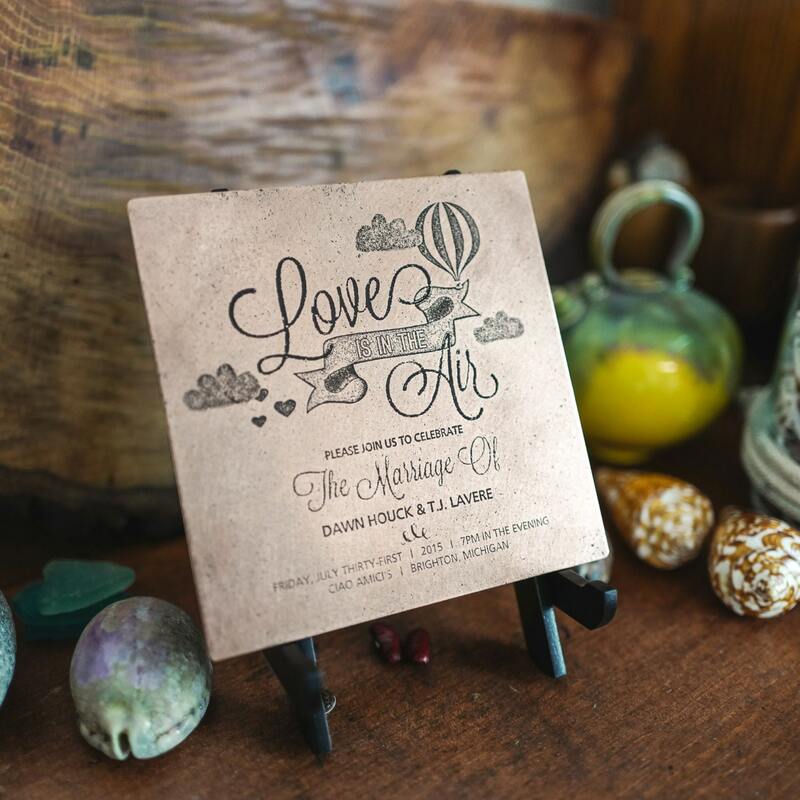 Our design, etching and final presentation production time is generally 3-5 days depending on the size and design complexity of your wedding invite. Please allow an additional 2-5 business days for shipping. 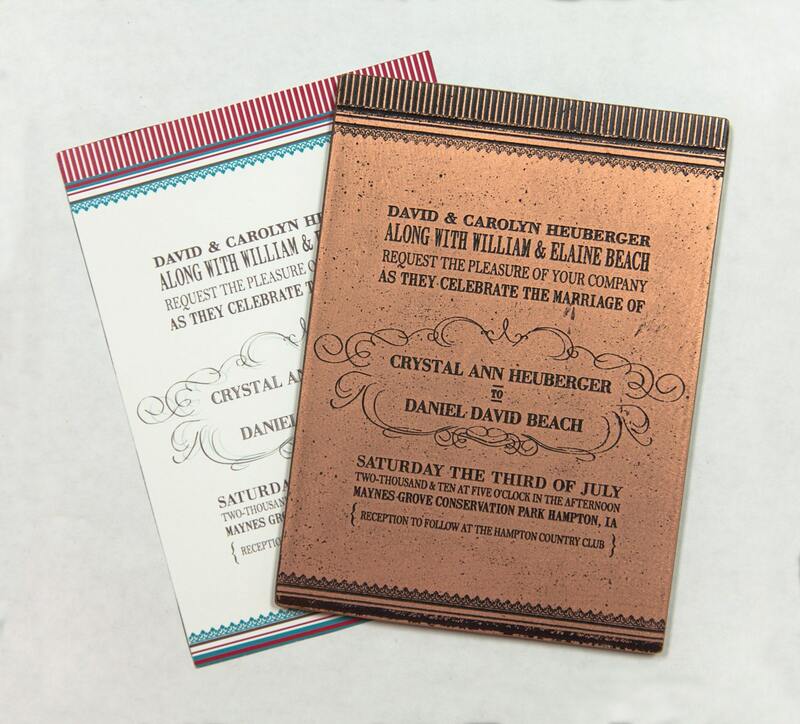 After the wedding invitation design has been etched into the recycled heavy 99.9% copper which is 18 gauge/32 oz., the backing of the Copper Wedding invitation is adhered with 100% natural leather material for final presentation. We also add a special U/V protective coating to guard the copper from continuing to patina. The final Copper Wedding invitation can then be proudly displayed using an easel or pictured framed at your convenience. This is sure to be a cherished gift. 7. RUSH ORDERS: If you need it expedited I will work with you to make it happen. Anniversary and Weddings are very special and I want to make sure that I can meet your timeframe! 8. SHIPPING: All orders are carefully packaged and shipped via UPS or USPS priority mail, which generally arrive within 2-5 business days domestically and 10-14 business days internationally. Shipping times are in addition to production times. Expedited shipping is available by request. For international orders, convo me before purchasing and I will give you an actual shipping price. Sales tax will be added to all Virginia orders. Shipping cost will be determined based on order destination and if express shipping is selected. The Copper Wedding Invite will arrive in a cloth bag, ready for gift giving! Our shop works to guarantee maximum satisfaction to service a highest quality product and we are very proud to make each piece by hand, with much passion and love. Thank you for considering our handcrafted artwork and products. We are a small family business based out of Virginia Beach, VA. Please let me know if you have any questions or need assistance with placing an order or if order is to be picked up locally at our studio, contact me via convo on Etsy or send me an email at juan [!at] vbcopper.com. ©2009-19 Copper Art Designs L.L.C - The designs, artwork, photos, fonts and content descriptions are Copyright and Intellectual Property of Copper Art Designs may not be used without prior written permission. We accept all payments via PayPal, credit cards, debit cards and Etsy gift cards. If you are having any issues with payment, please contact me directly. Items will not ship until payment has been received and cleared. In the event of no payment and no response via email after 48 hours, the purchase will be canceled. Your order will ship to the address you choose during checkout on Etsy. To ensure no delays please double check your order and address before it is placed. The processing time for orders is currently 10-14 working days. Occasionally a package will go out early, but please expect your order to ship 10-14 working days from your order date. On custom orders there may be some additional time and you will be notified. Shipping prices are determined by the size of Copper Art piece, cost of our shipping boxes, mailing envelopes, supporting cardboard, other shipping supplies, as well as USPS or UPS postage. We ship every 3-5 days via USPS or UPS, which means your item, should arrive 5-10 days from the purchase date. Tracking is included. We ship Priority Mail though the U.S. Postal Service with Delivery Confirmation, and/or through UPS. Every single package is insured and trackable. I use U.S. Postal Service for my international shipments. As a seller I have no control over your country's customs charges and duty fees. Some countries will charge duty for international packages and others will not. And each country's fees are different. Most packages go through without any charges, but please be advised that Etsy, nor I, have absolutely no control over how each country charges. Please understand that these are not extra shipping charges charged by us. (Please know that I can't refund you for PERSONALIZED items, if you refuse to pay the fees and have the package shipped back. I can only refund you on the items that are not personalized.) You are responsible for knowing your country’s customs and duty policies. We ship international every 5-7 days via UPS international, which means your package can take from 12-17 days to arrive after purchase. I ship First Class USPS International for outside of the North Americas and it does not include shipping confirmation to all countries, but I do insure all International shipments. Tracking is not included in the price of international shipping, if you would like to add this option for your security, please contact me. Although it is unlikely, we cannot be held responsible for international packages that go missing. NOTICE: some countries have specific customs rules, sometimes taxing merchandise coming in from abroad. The customer is responsible for paying these taxes in his or her own country. “Rush Orders” is offered as a separate offer listing. However, I firmly believe in Quality Assured process, so please understand that on certain “Copper Artwork” it is impossible for me to get orders out in less than one week, so please, only contact me if you are not willing to wait up to 10 business days for your order. We try to accommodate rush orders but we can only make guarantees on a shipment date, not a delivery date. Once the package leaves our studio, we have no control over the actual transit time. Standard shipping method is UPS Ground (approximately 1-5 business days). However, you can purchase a shipping upgrade to Next Business Day or 2 Business Day mail deliveries once the item is in your cart. Note that Next Business Day mail is one (1) Day delivery to most US locations and excludes Sundays and holidays. Please ensure that you have a safe location for your order to be delivered to. We have no control over and are not responsible for stolen or damaged packages that result from being shipped to an insecure location. If a package sits outside for a long period of time or in an unsafe location, it could potentially be stolen, broken, or opened. All shipping costs incurred due to non-acceptance are the responsibility of the buyer. Items returned will be refunded only after they arrive back to our studio safely and in the same condition they were sent, less all shipping charges. Orders that are returned to us due to an incorrect address will not be reshipped until we hear back from you. In this case, the buyer is responsible for paying the second postage cost. We want you to be happy with your artwork, jewelry, commemorative piece, etc and offer a 100% satisfaction guarantee. We take great pride in the quality of the products we handcraft and offering great customer service is our top priority. If you're not 100% satisfied with your purchase for ANY reason please contact me and allow me the opportunity to resolve any issues or offer some solutions before leaving an unflattering review. We strive to be a five (5) star shop and want every customer to be completely satisfied and delighted with their product(s) and experience. On custom and personalized Copper Artwork there is a cancellation fee of 25% if you cancel your order after your draft proofs have been approved. When you place an order and commit to using our service, we immediately begin working on your personalized draft proofs on all personalized copper artwork. The customization and design process is included in the pricing of our copper artwork and after it has been completed we cannot refund that part of the cost. Once you have approved your draft proofs and the production process has been started, you cannot cancel your order. Custom pieces (any item created with personalized text or special orders of any kind) are final sale and are non-refundable. This is because time, materials, and it being custom orders we cannot re-sell any item. An exception to this is an error made on behalf of Copper Art Designs that deviates from your original order (such as incorrect spelling of a name, quote, date, etc). Keep in mind that we will work with you and provide you a draft proof image of your custom art piece for approval before we commence the process of creating the art piece. For large Copper artwork, in the event that your art arrives damaged, please contact us immediately. Please do not throw away any packaging material. We will request that you take pictures as the item will be insured. We will make arrangements to have the art picked up and a replacement will be shipped to you, or we will reimburse you for the purchase price of the piece. Please check the shop announcement at the top of the shop home page https://www.etsy.com/shop/CopperArtDesigns for important information regarding delays/vacations, sales, etc. Custom work is always welcomed! If you have an idea for something you'd like to see in copper, simply contact us at team [!at] vbcopper.com and we would be pleased to discuss new projects together. Copper Art Designs prides itself on providing one of a kind custom copper art work and commemorative art pieces made specifically for you! Our art work or our ability to etch your commemorative art pieces (e.g. award plaques, wedding invitations, book marks, etc.) into copper is unique due to the intricate creation process which is all handcrafted and involves designing, hand-tooling and if required some natural patinas to be applied on to the copper. Our work is hand made in a small family-owned studio in Virginia Beach, Va. In-house artisans use traditional print making and chemical etching techniques to create unique works from quality materials paying close attention to detail and professional craftsmanship. Chemically etching copper is a centuries old process by which designs are positioned on a copper plate and laid in a chemical bath that slowly eats away at the metal to form designs in its surface. Patinas and fills are then applied to accent the design. Pieces are then finalized with a protective durable lacquer or wax which provides tarnish protection as well as superior resistance to UV light, salt air environments, and most chemicals. Due to the unpredictable nature of our process, each piece has its own characteristics that cannot be replicated. The smooth or rough textures and subtle hues are created based on elements such as weather conditions and application of specific organic chemicals applied for various durations. The etched surfaces of a finished piece will have slight imperfections giving a rustic appearance. You may see several pinholes and lifted areas on your piece. More often than not, these “imperfections” add beauty and texture to the finished piece. Our goal is to provide you with a life-enhancing product that fits your personal style and that honors your home or office decor. Typically on commemorative art pieces (e.g. award plaques, wedding invites, book marks, etc.) are ordered without any patina, it is in its natural copper state. 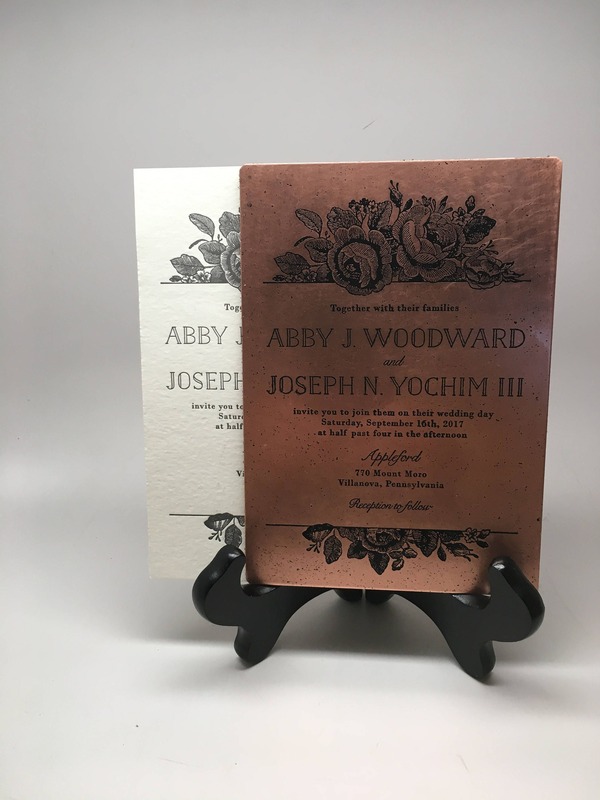 After the design has been etched into the recycled copper, the Wedding invitation, Award Plaques, etc are adhered with 100% natural leather material for final presentation. We also add a special U/V protective coating and wax to guard the copper from continuing to patina. The final commemorative art pieces can then be displayed using an easel or pictured framed at your convenience. ©2009-19 Copper Art Designs L.L.C., all rights reserved. Copper Art Designs reserves all rights to its copyrights (including but not limited to: designs, images, text). None of this material may be distributed, reproduced or otherwise copied without explicit written permission from Copper Art Designs. Due to variations between computer monitors, colors may vary slightly from what you view on your screen. Thank you for reading our policies! As a reward, please convo me via Etsy and add the coupon code POLICIES27 for 5% off your purchase. Chemically etching copper is a centuries old process. Designs are positioned on a copper plate and laid in a chemical bath that slowly eats away at the metal and transforms the designs into the copper's surface. This technique was originally used primarily for print making. Etched copper plates would be inked and then used to stamp news print or other various print materials. In our production, we have taken the process to another level using the copper as the canvas to display the etchings as artwork. Patinas and fills are applied to accent our designs. Our copper pieces are finalized with a protective durable lacquer/wax which provides tarnish protection as well as superior resistance to UV light and salt air environments. Due to the unpredictable nature of our process, each piece has its own characteristics that cannot be replicated. The smooth or rough textures and subtle hues are created based on elements such as weather conditions and application of specific organic chemicals applied for various durations. The etched surfaces of a finished piece will have slight imperfections giving a rustic appearance. You may see several pinholes and lifted areas on your piece. More often than not, these “imperfections” add beauty and texture to the finished piece. Custom work is always welcomed! All items in my copper shop can be customized or personalized. Copper Art Designs prides itself on providing one of a kind custom copper artwork and commemorative art pieces made specifically for you! We love working with our customers, if you can dream it, we will do our very best in handcraft it! Our artwork or our ability to etch your commemorative art pieces (e.g. award plaques, wedding invitations, bookmarks, etc.) into copper is unique due to the intricate creation process which is all handcrafted and involves designing, hand-tooling and if required some natural patinas to be applied on to the copper. There is a cancellation fee of 25% if you cancel your order after your draft proofs have been approved. When you place an order and commit to using our service, we immediately begin working on your personalized draft proofs on all personalized copper artwork. The customization and design process is included in the pricing of our copper artwork and after it has been completed we cannot refund that part of the cost. Once you have approved your draft proofs and the production process has been started, you cannot cancel your order. Standard shipping time for our copper artwork is approximately one week from draft proof approval. Your order will ship to the address you choose during checkout on Etsy. To ensure no delays please double check your order and address before it is placed. The processing time for orders is currently 5-7 working days. On custom & personalized orders there may be some additional time and you will be notified. “Rush Orders” is also offered as a separate offer listing. However, I firmly believe in Quality Assured process, so please understand that on certain “Copper Artwork” it is impossible for me to get orders out in less than one week. Please contact me if you are not willing to wait up to 10 business days for your order. Juan's work was beautiful and arrived on-time, making it a wonderful gift. The final product exceeded my expectations -- he also went above and beyond to stick to the timeline in the face of severe weather. The care put into this work is evident. Thank you! Loved the invitation! Got it as a gift for someone, and cannot wait to give it to them. It was fast too.